I have a confession, I have yet to purchase a mothers day present! I know, I know I am such a bad daughter, what I have been thinking about is where to eat, you can always rely on me to think of my gut first and everything else is secondary. When it comes to gifts for special people in my life, I always end up getting them the same thing, may sound a little lazy, but it is always what they want and I try and to aim to please. This year I'm not going to get the same beauty products, son mum, but I am going to treat you to something different, plus, maybe just maybe it is what I want from my daughter, obviously an abundance of hugs and kisses, plus my girl as you may of heard on my Twitter page, she has learnt and decided on how to wash up, an added bonus present if you will. 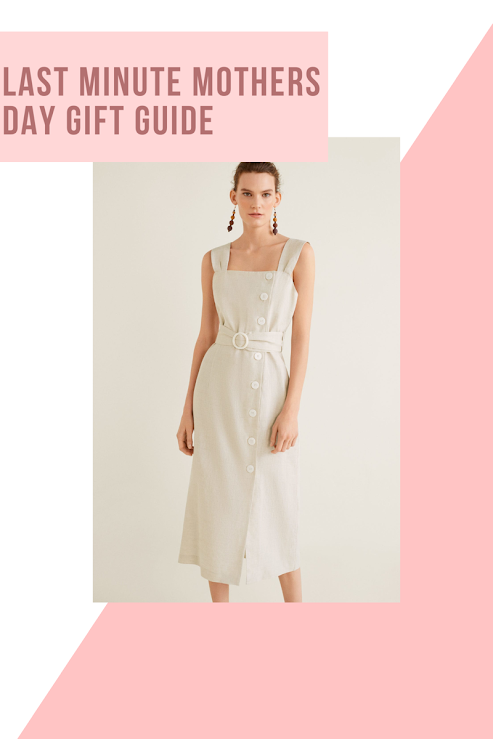 With Spring officially here, there is no better time to invest in some classic linen dresses and every year Mango has a great selection of beautiful cut linen dresses. I do not think any of us are ready to officially bare our toes and a great pair of luxe sneakers like these Veja's are what most women have been lusting after, especially for those busy mums on the run. A great face oil always makes for the perfect gift and for those wanting to try a new brand that works wonders, Herbivore's, Lapis Balancing Facial Oil is a beautiful addition to anyone beauty regime for glowing skin this Spring and if like my mother they are big beauty fans another beautiful gift is the Drunk Elephant gift set which you can purchase at Space NK also, is perfect for the jetting Mumma. Accessories, who doesn't love them from this super cute handbag from Topshop perfect for your mother to carry for the Mother's Day lunch and these beautiful shell earrings from Mango. Who doesn't love a naughty piece of chocolate and who better to turn to for something luxurious, non-other than Liberty, I remember my mother use to meeting me here after I finished work and hands down I'd always find her in the confectionary area bagging a few treats. There is no mum in this world that would not want a beautiful smelling candle, I for one love them and Santal 26 have beautiful scents perfect to burn of an evening, talking of what better way to relax than with a new set of jammies and these cozy Just Sheepskin slippers, with your feet up of a night, candle burning with a book in hand and little piece and quite. 8 Out Of !0 Cats, But I Only Need The One!